San Diego tide information. 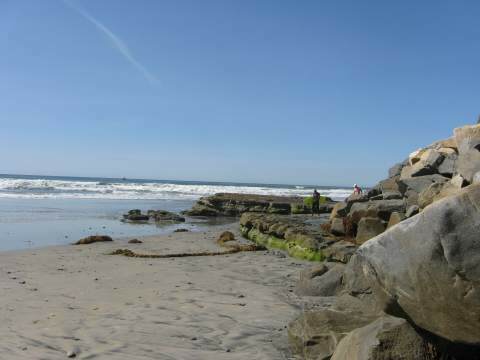 Learn about coastal tides and how they effect the San Diego beaches. If you've ever gone to the beach at high tide, you might be disappointed to see that wide beautiful beach be much smaller. So find out about the tides before you visit the beach! What are Tides? Tides are the rise and fall of the sea surface along the coastline. They are caused by many factors, the biggest being the gravitational pull of the moon and the sun. Tides are actually very long-period waves that originate in the oceans and move toward the coast. When this wave reaches its crest or highest point, high tide occurs. At the trough of this wave or low point, low tide occurs. They vary considerably at different locations on Earth. What Causes San Diego Tides? What Causes San Diego Tides? Many things influence the timing, range and interval of tides in San Diego Cal. The biggest factors are the gravitational force from the sun and moon. Other factors include the depth of the water, shape of the coastline, ocean-floor topography, barometric pressure, winds and weather. Our tides are on a 24 hour 50 minute cycle (corresponding to the lunar day), which means the high and low tides appear 50 minutes later each day. Most days will have two high tides and two low tides, but the magnitude of the tidal range between the high and low varies considerably. Many of the factors that effect the tides are known, so predicted tides are shown in the San Diego tide chart or table, based upon average weather conditions. 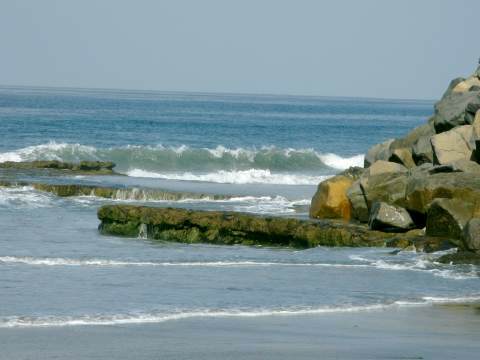 Actual tides for any day can vary from predicted, especially when the weather is bad, which is not that common in San Diego CA, which is why we locals love this climate! Generally when the moon is full or new, it is lined up with the earth and sun, creating strong gravitational forces that result in San Diego high and low tides that are more extreme like this example shown above, with a high tide of 6 feet and a minus low tide of -1 foot. These are also called Spring Tides. When the moon is near its quarter phase, the gravitational forces are weaker so the San Diego tides are less extreme, in this example shown above, ranging from a high tide of 4.5 feet to a low tide of 1 foot. These are also called Neap Tides. Be sure to take the actual weather conditions into account when making tide-critical decisions. When storm surges or extreme weather conditions are approaching, be safe and sure by checking the San Diego Weather Forecast to see how it may influence San Diego tides. As a general rule, prolonged onshore winds or a low barometric pressure results in a higher sea level than predicted. Offshore winds or a high barometric pressure generally results in a lower sea level than expected. National Oceanic and Atmospheric Admiintration, or NOAA, is responsible for predicting the tides. They publish predicted tide tables for San Diego, which are used to generate these graphical tide charts. Why are San Diego Tides Important? Beach walkers and joggers look for low tide levels for walking or jogging long distances on the beach. For example, you can jog from La Jolla Shores to Del Mar, Cal. when the tide is low, but you won't make it past the tidepools south of Black's Beach if the tide is too high. Tidepool explorers look for minus tides, which are low tides that are below average, to find good times to explore tidepools. Surfers use the tides as one criteria is selecting the best surfing spot for that day. Beach visitors to smaller, local beaches may find these narrower beaches disappear at some high tide levels, only to reappear as the tide falls. Fishermen use their knowledge of the tides to improve their catch of fish, as fish or bait may concentrate in certain areas based upon the tidal conditions. Many people have been caught by surprise because they didn't understand the importance of the tides. Don't walk up to a secluded beach at low tide, and be unable to return because it is now high tide. Don't climb on some interesting rocks along the shore, and now be overwhelmed by large waves from the rising tide. Don't take a boat into an area at high tide, and now be stranded at low tide. So for your safety, always check the predicted San Diego tide schedule and the weather.